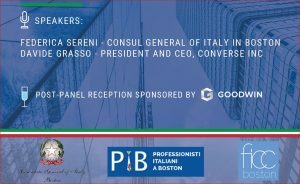 Please join us on Wednesday, November 14, 2018 at 6:30 PM at the offices of Goodwin, Procter LLP, 100 Northern Avenue in the Seaport, Boston, to hear two proven leaders, a corporate CEO – Davide Grasso, and a seasoned diplomat – Federica Sereni, tell us about their experiences and approaches to leadership. We are glad to team up with PIB for this event. 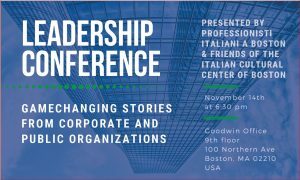 Please be sure to RSVP through the link provided, as space is limited and pre-registration is required.